Pictured, from left, are Lara Rittenhouse, Halee Allen, Lexi Rittenhouse, Heather Burba, Riley Burba, Rylan Rittenhouse and Hunter Sheeley. 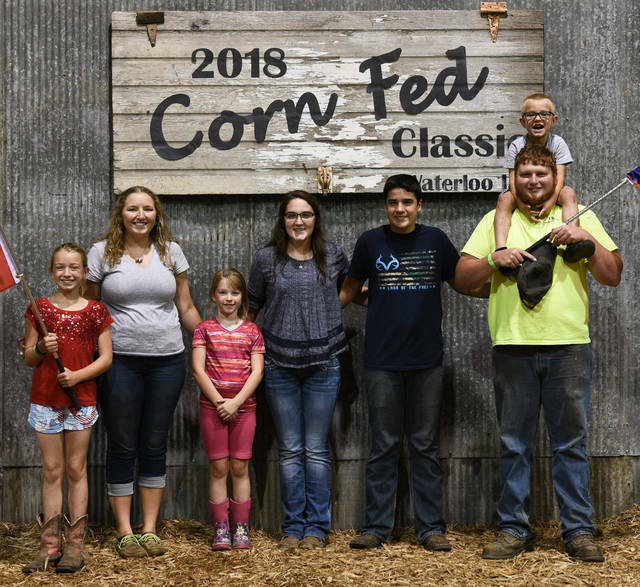 Two members of the Hillsboro FFA Chapter recently attended the AGJA (American Gelbvieh Junior Association) Corn Fed Classic in Waterloo, Iowa. Heather and Riley Burba spent a full week hanging with family and friends, meeting new people, and participating in fun activities as well as shows and contests. Heather participated in the skillathon, photo contest, showmanship and the show. The skillathon consisted of taking a test of many questions about the animal, equipment you might need, feed, and much more. The more questions you get correct, the higher you place. The photo contest consisted of entering three photos that would be judged. Heather placed fourth in the senior division with one of her photos. In the show, Heather placed eighth in her class with her heifer MV Miss Estelle. Riley participated in showmanship and the show as well as other fun activities. This was only his second time showing and very first time in showmanship. In showmanship, Riley placed third and made it to the final drive. In the show he placed second in his class, both with the same heifer MV Elliana. “It was a great experience getting to meet new people from different states and learning more about the Gelbvieh breed.” said Riley. During the week the kids didn’t just show and participate in contests. The AGJA board was able to get tickets for all the AGJA participants to go to a waterpark called Lost Island in Iowa. All the kids had lots of fun and enjoyed it. However, that wasn’t all. To top off the long week in Waterloo, Iowa there was a banquet to congratulate and recognize all the hard work the students put in. With a little help from other Ohio participants, Halee Allen, Hunter Sheeley and Lara Rittenhouse, the Ohio delegation was awarded The State Challenge Cup Banner for 10 or less head of cattle. Points are earned throughout the week based on participation with cumulative points counting toward the award. Submitted by Heather Burba, Hillsboro FFA. https://www.timesgazette.com/wp-content/uploads/sites/33/2018/08/web1_FFA-pic.jpgPictured, from left, are Lara Rittenhouse, Halee Allen, Lexi Rittenhouse, Heather Burba, Riley Burba, Rylan Rittenhouse and Hunter Sheeley.